Switzerland is the complete tourist destination. Its natural beauty—which includes mountains like the Matterhorn, the Eiger and the Monch and Lakes Geneva and Lucerne—enables you to get away from the grind of modern life and breathe some of the freshest air on the planet. Switzerland's man-made beauty is another reason to come. 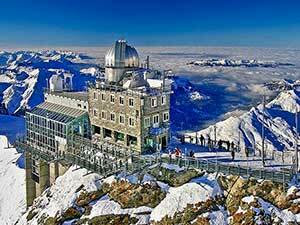 It includes the medieval old towns of Bern, Zurich and Geneva, rustic mountain chalets, awe-inspiring mountain railways, and bold modern structures such as the Paul Klee centre in Bern. Switzerland's weather is gloriously warm in summer and not excessively cold in winter. Peak summer season in the mountains is between July and August, with travellers who come in June and September avoiding the worst of the crowds. 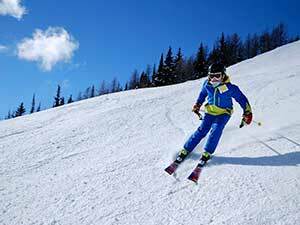 Peak ski season spans mid-December to March. And Bern's main cities are open for business all year-round. Finally, Switzerland offers fabulous traditional and international cuisine and high-end hospitality in its main cities and best alpine resorts (Zermatt and Grindelwald). And, though a little pricey, Switzerland is a safe, efficient and stress-free country to visit. With a population of about 8 million, the landlocked Switzerland—bordered by Italy, France, Germany, Austria and Liechtenstein—is only the world’s 96th most inhabited country. On the other hand, its people enjoy the world's 8th highest per capita income. They live principally towards the centre of the country, on the Swiss plateau—bordered to the east and west by the Swiss Alps and on the north and west by the lower and less famous Jura mountains. 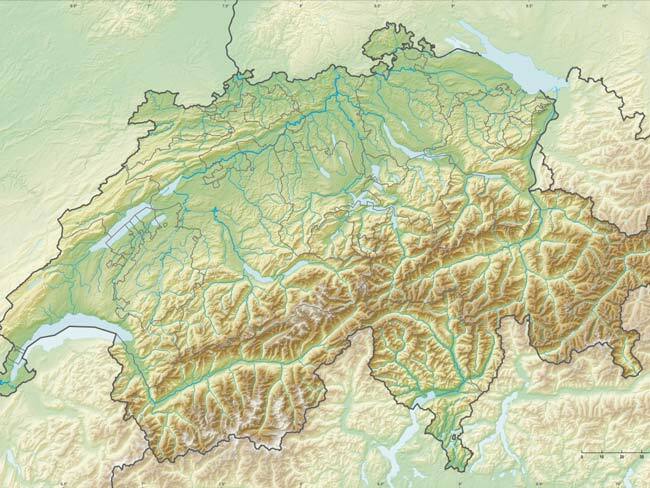 The Swiss speak a variety of languages: French in the west, spoken by about one fifth of the population; German in the north, east and centre, spoken by about two-thirds; Italian in the south, spoken by about 6.5% of people; and Romansh, spoken by only 50,000 people in some French and German speaking regions. English is also widely spoken, especially in the principal tourist destinations. 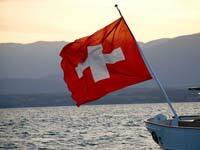 Switzerland’s main industries include banking and finance (UBS and Credit Suisse are its largest banks), the manufacture of pharmaceuticals and precision products (by companies such as Novartis, La Roche, Omega and Patek Phillipe), food production (popular exports include Emmental and Gruyere cheeses and Lindt and Toblerone chocolates), agriculture and tourism. It boasts a relentlessly efficient transport system. The Swiss national railway company, the SBB, operates fast intercity trains as well as more sedate services such as the Glacier Express from St Moritz to Zermatt—offering panoramic windows and passing through 231 tunnels! Its policy of neutrality means that it has not been involved in armed conflict since 1815. The Red Cross was founded in Switzerland, and it is here that the UN has its European headquarters. 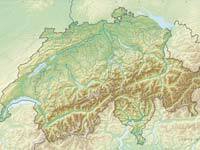 Swiss cities are regularly cited in quality of life surveys. Switzerland’s democratic tradition—with significant powers devolved to its 26 cantons—stems from the creation of the Swiss Confederation on 1 August 1291. The long list of famous Swiss citizens includes Jean-Jacques Rousseau (1712-1778, philosopher), Max Frisch (1911-1991, writer and dramatist), Le Corbusier (1887-1965, architect), Paul Klee (1879-1940, artist), Ursula Andress (1936 -, actress), Marina Hingis (1980-, tennis player) and Roger Federer (1981-, tennis player). The German-born Albert Einstein also carried out much of his most important work from Bern. Bern, the federal capital of Switzerland, is a joy to explore. Start with the imposing Swiss Parliament building and continue into Bern’s Old Town—complete with its historic clock tower, wide cobblestoned streets, shopping arcades and bear park. Not that Bern lack natural beauty. 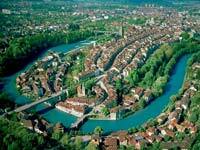 The turquoise River Aare flows around the old town, and on a clear day you can see the Swiss Alps from the city centre (the view from the spire of Bern’s cathedral, Bern Minster, is not to be missed). 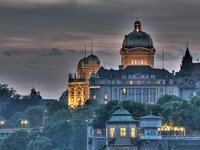 The Bern experience is completed by high-class hotels, cuisine and museums such as the Bern Museum of National History and the Einstein museum (celebrating the life and work of Bern’s most famous resident). Zurich, Switzerland’s most important banking and financial centre, is found towards the north of the country. Zurich too offers a wonderful Old Town and is bifurcated the River Limatt, flowing into Lake Zurich (just one of Switzerland's stunning bodies of water). 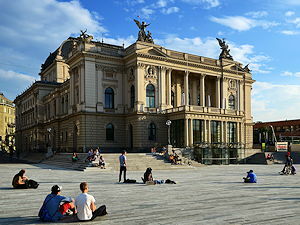 Zurich's varied visitor highlights include the Swiss National Museum, its bustling shopping district, its imposing protestant cathedral (the Grossmunster), the Zurich Opera House, and the 4000+ paining collection of fine art displayed at the Kunsthaus. Geneva is Switzerland’s other major financial centre and second most populated city after Zurich. Regularly ranked as one of the world’s best cities for quality of life, Geneva is a cosmopolitan place: it is home to many of the world’s leading international organisations/NGOs, including the Red Cross, the WTO, the World Economic Forum and CERN (the world’s largest physics laboratory). A visit to Geneva would not be complete without taking in the Palace des Nations, formerly home of the League of Nations and now the UN’s second most important site. 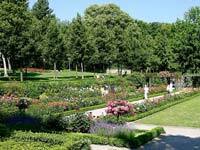 Other attractions include the beautiful Old Town, Lake Geneva, and Geneva’s many fine churches, museums and galleries. The car-free Zermatt is Switzerland’s premier alpine resort. 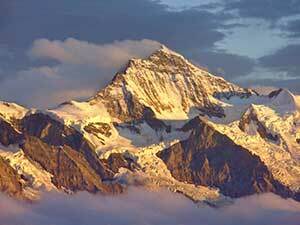 Found to the south of the country, close to the Italian border, it is towered over by the 4,478-metre Matterhorn. 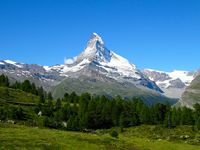 This perfectly formed peak is just one of over twenty four thousand metre peaks in the ranges which surround Zermatt, accessible on foot or by a variety of cable cars and the Gornergrat mountain railway. But Zermatt is not just about the mountains. Its bustling town centre offers high quality hotels, cuisine and shopping. And it boasts a number of annual festivals and events, such as Zermatt Unplugged and the Zermatt Marathon. Grindelwald, found towards the centre of the country, is another fantastic mountain destination. It offers lush alpine pastures leading up to the mighty peaks of Monch, the Jungfrau and the Eiger. 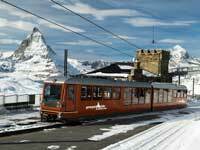 Visitors can get up close and personal with this triumvirate of alpine beauties by taking a ride on the Junfraujoch railway, which winds its way through tunnels blasted into the Eiger to whisk you up to an altitude of 3471 metres. From here you can explore the mountains up-close from the Sphinx observatory (pictured). Grindelwald also offers great hospitality and a number of the best walks in the country, in particular the Kleine and Grosse Scheidegg day walks. Other smaller resorts include Saas (in the valley next to Zermatt, offering a more traditional mountain experience) and the Val D’Anniviers (a pristine valley in the French-speaking part of Switzerland, offering pristine wildlife away from the tourist hordes). Peak winter season is mid-December to late spring, with the Christmas/New Year and Easter periods being the most expensive. The month of February is also considered high winter season. The summer season runs from late June/early July (when the snow melts to open up the higher summer walking tracks) until late August/early September. Visiting Switzerland is not cheap. At present, the US Dollar/Swiss Franc exchange rate is about 1:1. Expect to pay CHF250 for a double room in a mid-range hotel, and at least CHF50 per person for twp-course meal out (excluding alcohol). Public transport costs can, however, be reduced by the purchase of a half-fare card (which can be used on trains and the excellent system of post buses as well as on most mountain railways, funiculars, lifts etc). As one would expect of a developed nation, the standard of service at hotels and restaurants is high. Try out the local cuisine if you can. 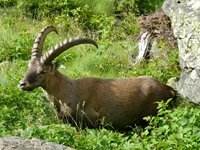 It includes mountain produce (milk, cheeses), meat (especially from the hunt, which takes place in September) and wine (produced in the south and west of the country, only 2% of which is exported). The most famous Swiss dishes are Raclette (cold meats with gherkins and pickled onions to start, followed by a main course of grilled cheese and potatoes and a dessert of pineapple and Kirsch), Fondue (melted cheese into which bread and meats are dipped) and Rosti (potato fritter). Many attractions close on Sundays and Mondays – so check online before you visit. Many smaller shops also close for lunch. The electricity system is 220v AC 50, which uses three-pin, round-pronged plugs (though the two-pin plugs used elsewhere in continental Europe often work too). Switzerland is one hour ahead of GMT in winter, and two hours ahead in summer. Watch out for a time trap for the unwary: in German, halb (half) refers to the half-hour before the hour (so halb 3 means 2.30 and not 3.30)!